I just simply love these fishes. They taste so delicious when deep fried with tons of spicy masala. After a very long time I found these fishes in the Asian Market. Immediately I grab a few good fish and told the seller to slice up them thinly.I still remember those days back in Singapore where I used to fight for the best parts of the fish with cousins. Rub the fillets with 1tsp of salt and let it stand for 10 minutes and risen. Pat dry and all the ingredients into a large bowl with the fillets. Marinate overnight. Heat a heavy bottomed wok with oil on medium flame and once heat deep fry them until golden brown and transfer to a serving platter with chopped coriander leaves and lemon wedges. Ohhh pass that plate dear..Spicy and yummy. I love fish. I am so excited to try this. Pomfret fish fry looks so classic , just like a star hotel platter. Superb recipe dear. Woww fish fry paathathume pasikuthu, superb fry and delicious slices..
Hi,your dishes are amazing and tempting.You have got a colorful space. Got no words to say-except looks simply mouthwatering! Pomfret fish is my favourite and seeing the picture I feel like having it now. Looks delicious . perfectly cooked and nice brown color.. looks very tempting! 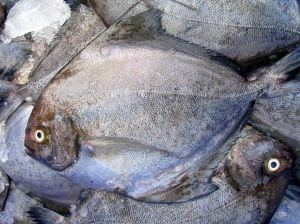 Is the fish used in the recipe pomfret or salmon as mentioned in the recipe.